Automakers are embracing virtual reality with help from a gaming company. Unity Technologies is probably best known for developing mobile games; the company claims 60 percent of the global market uses its software. But Unity has quietly worked with major automakers to develop virtual reality tools, new human-machine interfaces, and more under its Unity Automotive division. “The way we started in automotive was partly by design, and partly because our customers told us to,” Tim McDonough, Unity’s head of automotive, told Digital Trends. The company shifted from building games to “building the tools for building games,” he said, but soon noticed that automakers were interested in using those same tools for other things. One of those uses is design. Automakers can combine Unity’s software with VR hardware like the HTC Vive to build full-scale models of new cars in virtual reality. This allows designers and engineers at Audi to physically walk around a virtual car to see how it looks, which saves the cost and time required to build a physical model. It also means designers and executives can see a new car no matter where they are. “It’s now possible for an executive … to put on a VR headset and get into the car,” even if the car hasn’t been built yet, McDonough said. A real seat and steering wheel can be used to make the experience more realistic. Unity claims this approach can save $3 million to $5 million per car design. It’s not just auto industry executives that can use VR to interact with objects that don’t exist in the physical world. Unity says automakers are also using its tech to lay out virtual assembly lines, both to train workers and to anticipate any issues before installing equipment for real at a factory. 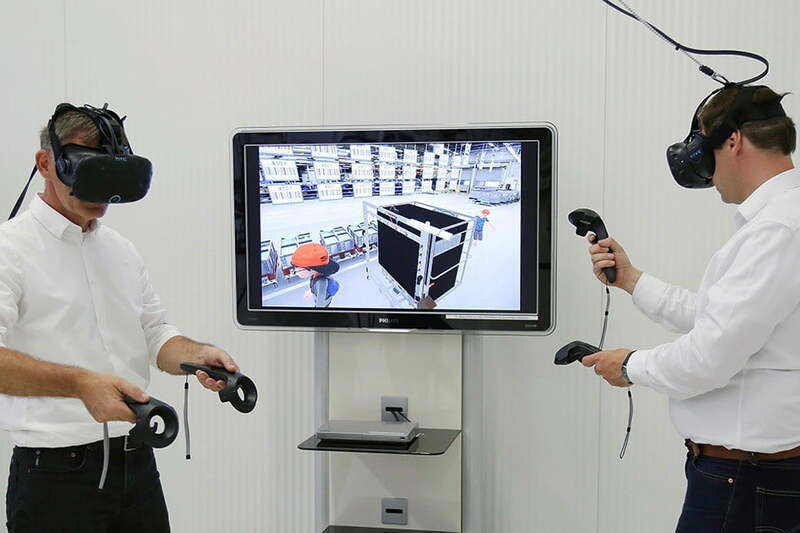 Volkswagen uses this tech to train workers across 120 global production sites, according to Unity. Once the cars are built, Unity-based programs can render them in detail, allowing customers to virtually inspect a car on a screen before heading to the dealership. Texel used this tech to create displays for the Lincoln Experience Center, where customers can go through a Lincolns’s features and try out options like paint colors without having to travel to a dealer lot. In addition to reducing shopping time for customers, Unity notes that it allows dealers to reduce inventory. There’s no need to keep a car with a particular set of options on-site just to show to customers if it can be re-created digitally. Going forward, Unity hopes to exploit two other major trends in the automotive industry: Advanced human-machine interfaces and self-driving cars. The company plans to use “learnings” from game development to create better HMI for future infotainment systems, said Danny Lange, Unity’s vice president of artificial intelligence and machine learning. “It’s all about personalization,” said Lange, who previously worked at Amazon and Uber, and hopes to use the retail giant’s penchant for reconfiguring interfaces to suit individual customers as a model. Unity software helps power the infotainment system in the concept car from Chinese electric-car startup Byton, which first appeared at CES 2018. The car can identify individual drivers through facial recognition, and save their preferences in personal profiles. Like many other companies, Unity expects autonomous driving to negate the issue of distracted driving caused by elaborate infotainment systems. “The gaming environment is a fantastic environment for testing these vehicles,” Lange said of Unity’s plans for self-driving cars. The same virtual models Unity’s software tools can create for car designers and engineers can be tested endlessly in virtual environments, crafted just like levels of a video game, Lange said. These simulations are less controversial than real-world autonomous car tests, and let engineers program specific scenarios. Other companies have already caught on to this: Waymo claims to have run 2.7 billion simulated miles last year, and Parallel Domain is marketing its own world-building engine to developers of autonomous cars. These virtual environments could be the test tracks of the future. Toyota’s ‘Project Portal’ brings a hydrogen-powered big rig to L.A.